Iconic, character-based music and hip-hop game, PaRappa The Rapper comes to a whole new generation of gamers with PlayStation 4 in PaRappa The Rapper Remastered. 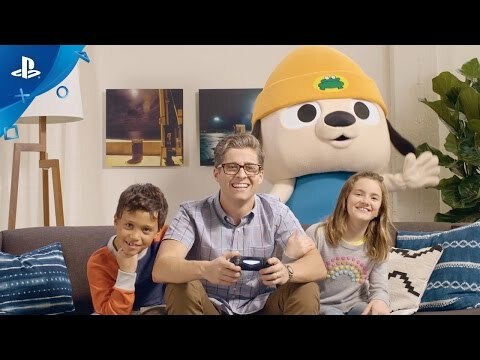 Developed in association with legendary multimedia musician Masaya Matsuura and famed New York artist Rodney Greenblat, the PaRappa The Rapper franchise debuted 20 years ago on PlayStation and is widely credited with establishing the music and rhythm game genre that continues to thrive today. PaRappa The Rapper Remastered updates the classic game with high res graphics providing smoother lines and textures, CD-quality sound, trophy support and new control features! Follow PaRappa as he attempts to rap his way into the heart of his dreamy love interest, Sunny Funny, through various musical adventures revitalized with enhanced graphics for today’s high definition televisions. PaRappa the Rapper Remastered was released on PS4 750d ago in the US and the UK. Notify me when PaRappa the Rapper Remastered is available. Based on 8 PaRappa the Rapper Remastered reviews, PaRappa the Rapper Remastered gets an average review score of 64. Still, it’s a technically solid remaster of a really fun game, so I’d still suggest picking it up. PaRappa the Rapper: Remastered is an excellent re-release of a PlayStation classic. The aesthetics and vibe are still unlike anything else out there, and they’re still worth the hassle. The frustratingly tight timing required and delay of PaRappa’s audio samples make it a chore to play. PaRappa the Rapper Remastered is a time capsule from the late 90s – warts and all. The graphics and gameplay definitely show their age – remaster or not. As much as I love PaRappa and his quest to find love with Sunny Funny, the experience was significantly marred with the visible lag and the lack of calibration options. I love PaRappa and his ‘I gotta believe’ attitude, but this early rhythm action game no longer holds up.